Your experience of a lifetime starts with D’Angelo Couture. Diane D’Angelo is an internationally known bridal gown and accessories designer who decided to make San Diego her home 30 years ago. Equipped with 50 years of design experience, Diane takes each Southern California bride’s unique dreams and makes them a reality. In addition to carrying her own, original line of gowns, she can customize a part of a wedding dress or create a completely custom gown. Diane designs because she believes that happy and comfortable brides are the most beautiful brides. Her passion for both her artwork and her brides can be seen in everything she touches. D’Angelo Couture Bridal is a full-service bridal salon centrally located in the Mission Gorge neighborhood for the convenience of all San Diego wedding parties. D’Angelo’s is unique in both its attitude and approach. We curate our selection of bridal gowns to provide each bride with her dream bridal dress at her dream price. We offer the largest selection of bridal accessories because we understand that the details make each look one-of-a-kind. 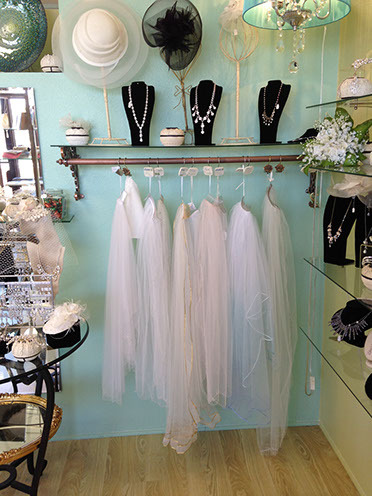 D’Angelo’s carries bridal gowns, tiaras, veils, bridal jewelry, bridal hairpieces, and shapewear. We take care of all your wedding apparel needs so that you can sit back and soak up this beautiful time of life. Get More Exciting Bridal Updates at Bridal Boutiques!